Thursday morning around 11:20 the 911 operator put out a call to the emergency services to respond to an accident with injuries. The one car accident occurred going up the Jim Cummings Highway across from the entrance to Pump House Road and Morgan Lane. The Cannon County Sheriffs’ Department responded along with the Rescue Squad and the Woodbury Fire Department. 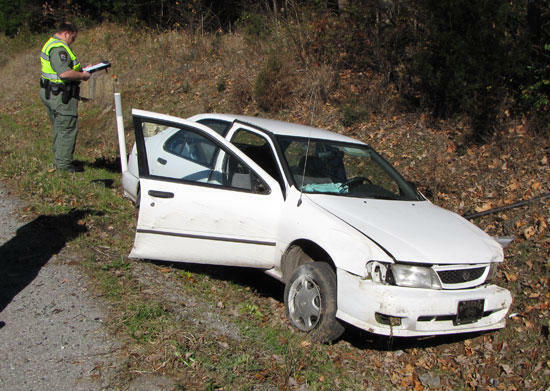 Margaret Odom of Petty Gap Road, Woodbury was two cars behind the driver when she saw the white Nissan Sentra dart across the highway and forcefully go into the ditch. Ms. Odom related to the Courier that the driver said she didn’t know what happened and thought it could be the steering. The driver, Olive C. Marx, age 60, of Coffee County, had to be freed from the vehicle by the rescue personnel. Life Flight was called in and she was sent from the hospital landing zone straight to Vanderbilt Hospital in Nashville.